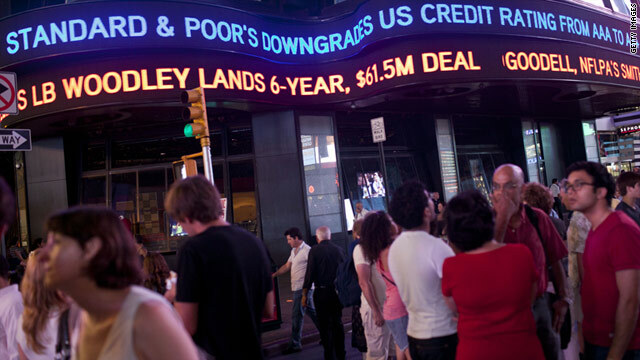 Standard & Poor's decision to downgrade the U.S. credit rating has increased concerns about the country's economy. Australian prime minister urges calm, saying only one agency has downgraded the U.S.
(CNN) -- International reaction to agency Standard and Poor's decision to downgrade the U.S. credit rating for the first time has been mixed. The move followed a week in which anxieties over Europe's debt crisis and the faltering U.S. recovery had spooked investors and made for volatile trading Friday, despite the release of stronger than expected U.S. jobs figures for July. Asia took a lead Saturday in expressing its concern over the potential impact of S&P's action on the global economy. In China -- which holds large amounts of U.S. debt -- a commentary published by the official Xinhua news agency was critical of the U.S. government and questioned whether the U.S. dollar should continue to be the global reserve currency. "China, the largest creditor of the world's sole superpower, has every right now to demand the United States to address its structural debt problems and ensure the safety of China's dollar assets," the commentary said. S&P's move served "as another warning shot about the long-term sustainability of the U.S. government finances," it added. Washington must stop its practice of "letting its domestic electoral politics take the global economy hostage and rely on the deep pockets of major surplus countries to make up for its perennial deficits," it said. South Korea's government said it would concentrate on limiting the spread of market uncertainty in the wake of the downgrade, semiofficial news agency Yonhap reported. "The news is bad and Seoul plans to keep very close tabs on how the market reacts," Yoon Jong-won, head of the finance ministry's economic policy bureau, was quoted as saying. Vice Finance Minister Yim Jong-yong will meet Sunday with senior policymakers from the Bank of Korea and other financial bodies to discuss what actions should be taken by Seoul, Yonhap reported. Still, Australian Prime Minister Julia Gillard urged calm over the U.S. downgrade, pointing out that only one of the three major ratings agencies had made that decision. S&P had been signaling they wanted to see a certain reduction in the U.S. deficit for some time, she said Saturday, but "the other two major ratings agencies, Moody's and Fitch, continue to have the American economy rated at AAA. So I think people just need to look at all of the facts." Gillard also pointed to the strength of the Australian economy, saying: "We are not immune to global events, but I think we should have confidence ... that our economic credentials are amongst the best in the world." Global economic anxieties led to volatile trading in Pakistan Friday, CNN affiliate Geo TV reported, as traders there and abroad sought to unload their holdings. U.S. facing double dip recession? In North America, Canadian Finance Minister Jim Flaherty said that his country "is not an island" and is interconnected with the United States and other trading partners, but said that Canada is "well-positioned to face global headwinds." He said that despite the uncertainty, it was an encouraging sign that the Canadian and U.S. economies are generating positive job growth. Reaction was slow to come out of Europe Saturday, where questions have been raised about how many European leaders -- including the U.K.'s David Cameron, Germany's Angela Merkel and France's Nicolas Sarkozy -- are presently on vacation. Sarkozy interrupted his holiday Friday to speak with Merkel and Spanish counterpart Jose Luis Rodriguez Zapatero, amid concerns that the euro zone's debt crisis might spread beyond smaller economies like those of Greece, Portugal and Ireland. Finance Minister Francois Baroin, in an interview Saturday for French television network i-tele, said France had "full confidence" in the strength of the U.S. economy. "The figures that were published yesterday on the (U.S.) unemployment showed a positive shift, better than expected, so it's going in the right direction," he said. "We also have faith in the fundamentals of this economy, which is one of the most powerful in the world and the U.S. government's determination to implement a plan which was approved by Congress this week." Germany's Merkel spoke on Friday with President Barack Obama, Cameron and Italian Prime Minister Silvio Berlusconi, as well as Sarkozy, about the economic situation, a German government spokesman said. Speaking Saturday to the BBC, U.K. Business Secretary Vince Cable pushed back against the suggestion that Cameron and his ministers were out of touch at a time of crisis, saying Britain was only on the periphery of the current issues. Asked about China's call for a new global reserve currency, Cable said it would be "a sensible way for the world to move" but that it would not happen quickly. "In the short run, the U.S. dollar is the key international currency and although, frankly, the American legislature has made a terrible mess of things a few weeks ago, they have now got back on track; they have undertaken to manage their debt in a prudent way," he said. Asked by CNN about the U.S. downgrade, the U.K. Treasury instead pointed to the fact Britain's AAA credit rating had been reaffirmed after the British government took steps to deal with the country's debts. "This is yet another illustration of why abandoning our deficit reduction plan would put Britain back in the international firing line," a spokesman said. In July, S&P placed the United States' rating on "CreditWatch with negative implications" as the debt ceiling debate devolved into partisan bickering. To avoid a downgrade, S&P said the United States needed to not only raise the debt ceiling, but also develop a "credible" plan to tackle the nation's long-term debt. John Chambers, head of sovereign ratings for S&P, said the slowness at raising the debt ceiling and the political infighting led to its decision. In announcing the downgrade, S&P cited "political risks, rising debt burden; outlook negative." CNN's Bharati Naik, Laura Smith-Spark and Saskya Vandoorne contributed to this report.